Firewood. It’s been essential to our way of life for thousands of years and somehow, even in a modern world full of gas and electric heating, it still finds its way into our lives today. Depending on where you live, climate and technology may dictate that you use wood as your main fuel source. However, if that’s the case, you probably already know a thing or two about cutting wood so I’m going to assume that you’ve either just moved to such a place, are simply curious, or that you’re a survival enthusiast looking for some pointers. Hey, when the world ends, anyone who knows how to do these things is going to be one step ahead! First of all, there are a few types of wood you shouldn’t be trying to chop. If it’s an emergency, you have to do what you have to do, but in general avoid wood that is overly knotted. Cutting wood is more accurately described as splitting wood, and wood with a lot of knots and gnarls in it is painfully difficult to split properly, so toss those pieces aside. Another biggie when burning old building material is to avoid pieces of wood with nails in it. Not only can this damage your axe, but you run the risk of having that nail fly out at a weird angle; unpredictability can lead to accidents, so try and just avoid it. There. You’ve had your safety warnings, let’s get to it. For larger pieces of wood, you’re going to want a splitting maul, whereas for smaller stuff you can use a standard axe. A splitting maul is simply a heavy axe with a thicker head. The added weight makes it ideal for going through a piece of wood all the way on the first try, and for making it through those larger pieces. Set up the piece of wood you want to split on end (it’s best on a hard surface like a rock or concrete, as dirt can have too much give). 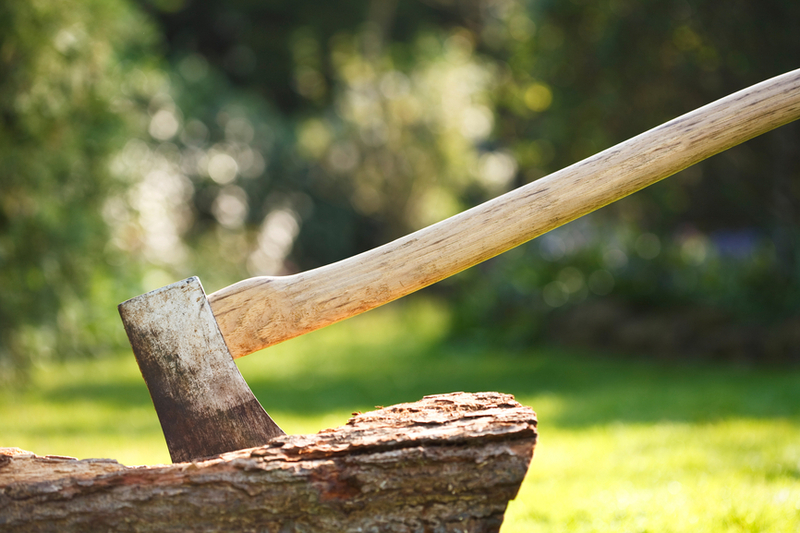 Stand an axe’s length away from the wood, so that you can bring the axe head down exactly on the center of the log. If you’re new to this, try to err on the closer side, so that if you miss the log your axe will simply hit the dirt, instead of the handle hitting the log if you overshoot things. Not only does this damage the axe, the vibrations hurt your hands! Also, always stand with your feet about shoulder width apart, or a little wider, to give yourself stability when swinging an axe. Work down bigger logs by splitting from the sides, getting rid of smaller pieces until the center of the log is more manageable. Rinse and repeat. The more you practice, the better you’ll get at hitting where you’re aiming and at splitting pieces all the way through on the first try. No matter what you’re looking to do, knowing how to split firewood so you can keep yourself warm is not a bad skill to have! Liked your wood splitting column and would like to add to it. When I am splitting wood I put the piece to be split on another piece of wood like a round so I am not hitting the ground that may have rocks or concrete to dull the ax head and it puts it up a little higher and if you have a hard wood like madrone get it split before it is dry,other wise it’s like a rock and very hard,we have madrona here in the NW.